I had a great conversation last night on Twitter about “silent reading” time. Some teachers feel it is a waste of time… that kids are more likely to become discipline problems during this time… that they’re not really reading… or that they’re not comprehending what they’re reading. I disagreed. And now, as I think about it, I can disagree because our school values and intentionally cultivates a culture of reading. This culture provides time, choice, modeling, reading aloud (for all our classes, not only our “littles”), discussion with peers, options in how/what/why they read, but most importantly that reading books is something we ENJOY. Books are gifts. Books are treasures. In my opinion – and 20+ years of teaching experience – those things kill the joy of reading. Those things tell kids, “Hey. I don’t trust that you’ll actually read this book unless I force you to complete something that proves you read it.” Those things don’t honor a student’s choice in what she wants to read. Those things tell kids that their reading is only valuable if they can talk to a teacher about what they just read. THOSE THINGS ARE ABOUT THE ADULTS IN THE CLASSROOM… NOT THE KIDS. If we control their reading, they are not going to want to read. In my classroom… Do we sometimes read a book together as a class and then discuss? Of course. Do we sometimes read books and then talk with a partner or small group about what we just read? Yes! Do we have book conferences? “Speed booking?” (like speed dating, but with books!) Do we discuss reading strategies, elements of a story, reading for entertainment, reading for information… YES. 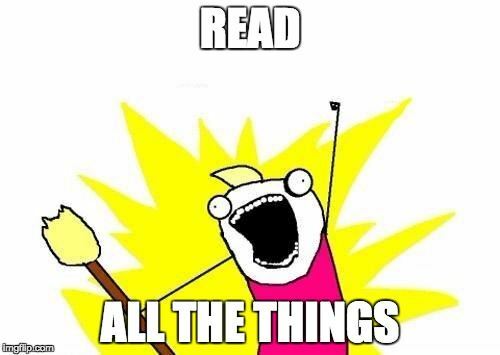 ALL THE READING THINGS! But to me, it is vital that kids ALSO have time provided for them to simply read freely – with no expectations of the how/what/why. Pernille is an extremely valuable resource for any educator, but she is also on of my list of “go to” teachers for anything having to do with reading and books. Do your students have choice in the types of books they read? Do students in your school have access to multiple genres? e-Books? Graphic novels? Comic books? Poetry? Picture books? If a student starts a book and doesn’t like it, does he have the option to try something else? How do the adults in your building model their own reading? Do the students SEE you reading? Most importantly… have you asked the KIDS how they could make silent reading a more enjoyable time? When you see statistics like these gathered from Pew in 2015, as educators, we should be doing everything we can to help foster a love for reading. I’ve been a lover of books from a very early age, but I was happiest when I had choice, options, and access to what *I* wanted to read. When teachers gave our classes silent reading time with choice, I was a happy camper… AND that freedom made me much more likely to want to read the books they wanted me to read, too. Books are gifts. Books are treasures. If your students don’t feel this way, this says more about the culture of reading in their environment than it says about them.